Plastic in retail: how on earth can we reduce it? 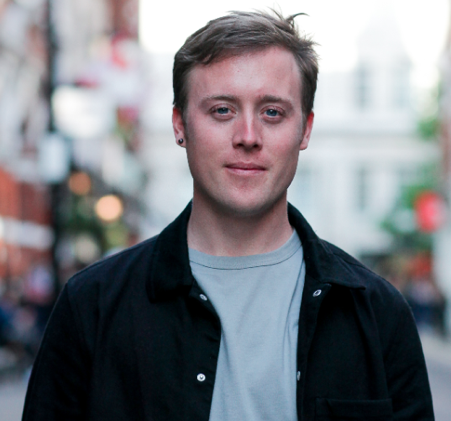 Will McCallum, Head of Oceans at Greenpeace UK, looks at how Cotswolds retailers, predominantly independent stores, can significantly contribute to eliminating plastic and the insurmountable pollution that's filling our planet. Like many tens of millions others, I was shocked to see mammals, fish and birds feeding on small pieces of plastic mistaking them for food whilst watching David Attenborough’s Blue Planet II. Figures show that plastic pollution has increased at a horrifying rate, in the last ten years, for example, we have produced more single plastic waste than over the entire century. Globally, people are acknowledging that our situation with plastic is ridiculous yet we’re still using it in vast quantities. Even though we understand that buying a bottle of water or fizzy drink and then throwing a good container away after we’ve used it once makes no sense, we still do it. In Britain alone we use 35 million single use plastic bottles in just one day. The dilemma is that we’ve created this material and use it at an unbelievable scale with no thought about what to do with it once it’s been used - items such as straws and plastic bags are used for a matter of minutes and yet they take almost 500 years to break down. The majority of consumers are also becoming aware of tiny pieces of plastic, often too small to see with the naked eye, that can also do harm such as microbeads and microfibres in clothing which are released when washed and account for a third of the plastic in the ocean. Other stats show that it’s estimated that between 4.8 million and 12.7 million tonnes of plastic waste enter the ocean every year, that’s almost a rubbish truck every minute. The fact that over 90 per cent of seabirds are likely to have plastic in their guts is due to this dumping and and if we continue at this rate we’re consigning future generations to a world in which plastic would easily outweigh fish in the ocean in 2050. In the many years I have been campaigning against plastic waste most people ask what they can do to help. Here I’ve tried to outline how retailers, independents in particular who often have a great relationship with their community, can really help win this battle. I know that it is impossible to list all the plastic alternatives in this article but at the end you’ll find some links that should help with advice and suggestions. To start with I would like to say that I appreciate plastic, it does a lot of good in certain parts - such as aiding people’s lives - straws for those unable to drink easily or in areas where the water is undrinkable - of course plastic in these situations is literally a lifesaver. What I’m focusing on is areas in which plastic, single use in particular, is not vital to our day-to-day living and could be eliminated. The good news is that independent stores have more freedom as to where they are source their products, they often have better and closer relationships with both their customers and suppliers who know and trust them and this is where the possibility of persuading them to eliminate plastic is more realistic. With the knowledge we have, reducing plastic is seen positively by consumers and in fact is a great way of increasing a shop’s footfall on a regular basis. If an independent store has a refill station then their regular customers will be in to use this and undoubtedly will browse and see other items they’d like to buy whilst in the store. As independents create great relationships with their customers they will be able to talk to them more easily about the plastic-free movement and engage them to participate if they haven’t already, without guilt and on the premise that we’re all in this together. Some independent shops have said to me that they are worried about a consumer backlash that if they start eliminating plastic, the products they sell will be seen as more expensive. Yet if you look into it then you’ll see that this isn’t the case, as something you can use more often has to be better value in the long run. The plastic-free campaign is absolutely not targeted at or exclusive to the wealthy or middle classes, it’s about buying sensibly and thinking twice about what’s put in the shopping basket and helping customers make that choice. There are two fantastic campaigns that independents can get involved with to become more proactive with plastic-free environments. The first is Surfers Against Sewage that runs a national campaign to encourage towns and cities to work with retailers and businesses to champion a plastic free existence, the number of businesses depends on the demographics and population size but if you’re interested in participating a good place to start is www.sas.org.uk. 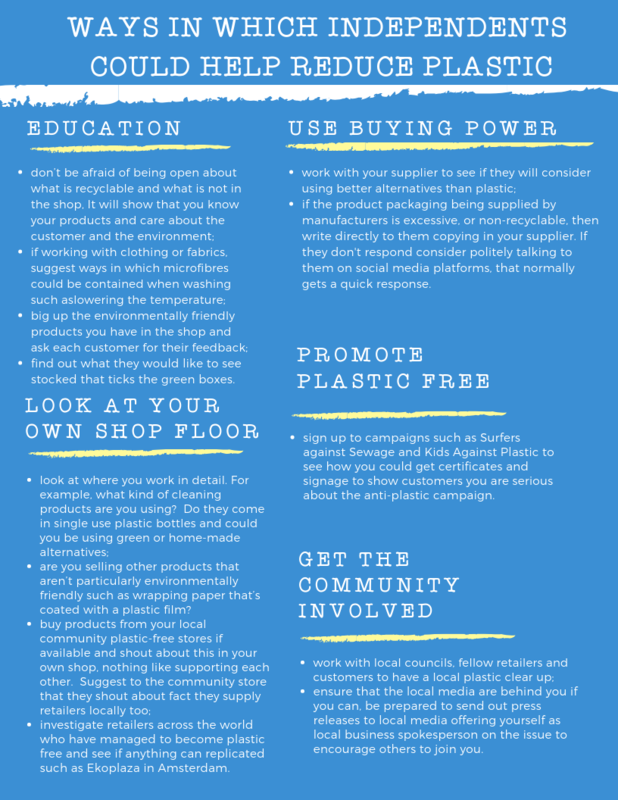 There is also Kids Against Plastic (http://www.kidsagainstplastic.co.uk) that promotes Plastic Clever - aimed at businesses, schools, cafes and so on - anyone who is striving to do better at using less or no plastic. It’s run by two teenage sisters, Amy and Ella Meek who themselves have collected over 50,000 pieces of single use plastic in the last couple of years. Apart from these two campaigns, I would say communications about plastic waste often aims to make us all feel guilty but the reality is no individual can be to blame. When we’ve bought products we haven’t always had the opportunity to choose how they are packaged and how can people be rebuked if the packing they have accumulated is not recyclable? Of course it goes further than just one person or a few companies taking part and government policy should be at the core of the campaign too. I was in Stroud recently and whilst taking a look around the town I noticed the Stroud Valleys Actions on Plastic stickers on windows saying ‘Fill your drinking bottle here’. I was delighted because this not only helps environmentally but also sends out a positive message of community. I doubt there’ll be a queue around the block with people wanting to refill their bottles but if they needed to then those who enter that shop will feel good about it, they’ll instantly feel welcomed which is how independents thrive. The special bond they have with customers and with small gestures like that they have the opportunity to forge even greater relationships. The Plastic Free Cheltenham campaign is also about to launch. It aims to see 34 businesses in the town change at least three of their products from single-use plastic in the next 12 months. For example, straws could be changed from plastic to paper. Anything that independents and all retailers can do to spread the message with consumers and suppliers will work towards making a difference because if there’s one message I’d like to get across it’s that the problem of plastic pollution is one that affects us all and therefore is a shared responsibility. Individually we can change our behaviour, pay attention to what we use but collectively we will achieve much, much more.